This site protects a large population of Red-cockaded Woodpeckers (RCW) as well as one of the largest contiguous tracts of old-growth longleaf pine forest in Florida. Get a bird checklist, forest road map and trail maps at forest HQ; maps are also available at the three major trailheads. Visitors can explore the forest either by car on unpaved forest roads, or on foot, bicycle or horseback via multi-use trails. Most open forest roads are accessible to two-wheel-drive vehicles. To really see and experience all the forest has to offer, three extensive, rustic trail systems are available, each with a trailhead off CR 337. The Tidewater, Apex and Black Prong trail systems feature dozens of miles of trails with multiple loops and endless permutations. To seek out RCWs via car, follow Gas Line Rd. northeast to Bee Hive Rd. RCW cavity trees are ringed with white paint. Expect to see Brown-headed Nuthatch, Red-headed Woodpecker, Pine Warbler and Eastern Towhee as well. Cow Creek Rd. and Black Prong Rd. 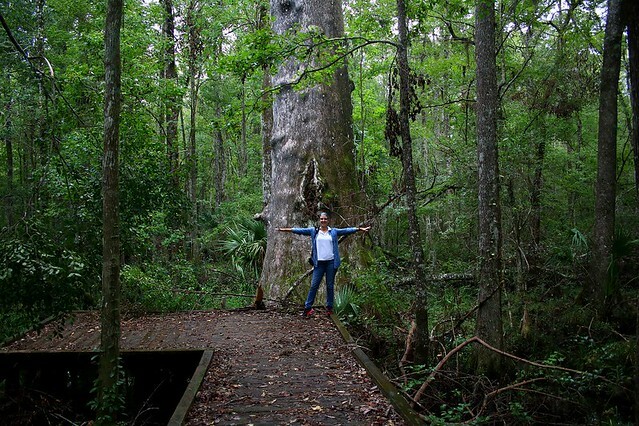 offer nice flatwoods, cypress domes and freshwater creeks; don’t miss the Big Cypress Boardwalk and the “Goethe Giant” an ancient Cypress tree that measures 9 ft in diameter, reaches 105 feet tall, and is 29 feet in circumference! Other wildlife to look for include Florida Black Bear, and Sherman’s Fox Squirrel, as well as a great selection of butterflies including Henry’s Elfin and Great Purple Hairstreak. Overnight camping is available by permit only. Seasonal hunting takes place at this site, please click here for details.